"I don't want to be a great dueler and lover. I'm turning in my sword and lips." The legendary Casanova had a reputation (much of it self-promotional) as a great lover, libertine, and swordsman. A bit on the irresponsible side (even though he ended up as a librarian), but certainly a memorable character no matter how you slice it. 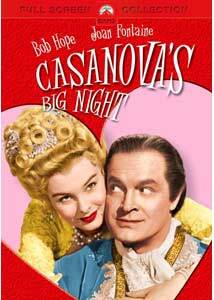 This period comedy vehicle for Bob Hope takes a look at how a commoner might fare if thrust into the position of Casanova, and how it might not be quite as enviable as it might seem at first blush. Hope stars as Pippo Popolino, an apprentice tailor who masquerades as Casanova to seduce the widow Bruni (Joan Fontaine) in 1757 Parma. When the real Casanova (an uncredited Vincent Price) skips town to dodge his creditors, including Bruni, Pippo is forced to masquerade as the libertine. He is promised 10,000 ducats by the Duchess de Castelbello (Hope Emerson) to test the virtue of Elena Di Gambetta, who is to marry her son Raphael (Robert Hutton). If Casanova/Pippo can retrieve an embroidered petticoat that was a gift from her fiancé, then that will suffice as proof that she is only in it for the money. Things grow more complex, however, when the Doge of Venice (Arnold Moss) gets into the act, since he has political aspirations towards Genoa that make it in his interest to disrupt the wedding plans too. Trouble ensues when Pippo demonstrates more of a conscience than Casanova ever had, but at the risk of his own neck. The gags come extremely rapid-fire throughout the film, with Hope snaring nearly all the laughs for himself. Many of the best zingers feel like they're being ad-libbed, and Hope does a good job with his typical character as an ordinary person stuck into a dangerous situation. It feels a little awkward when he takes a more Shakespearean attitude toward the text, but on the whole it's pretty entertaining. Joan Fontaine is a great foil for him, as is Basil Rathbone as Lucio, Casanova's manservant who plays along with the impersonation to get his back wages. The supporting cast is chock full of notables, from a small scene with Lon Chaney Jr. as an imprisoned murderer sharing Pippo's cell (complete with an amusing reference to his character of Lennie from Of Mice and Men) to John Carradine and Raymond Burr as the Doge's advisors. Even heavyweight champion-turned-professional wrestler Primo Carnera gets into the act. One of the notable achievements of the film is its beautiful production design, headed by the exquisite costumes of Edith Head and especially Yvonne Wood, who did the men's costumes. They're quite stunning and really come through nicely in the Technicolor photography. The re-creation of Venice is quite plausible and an attractive piece of art direction. Director Norman Z. McLeod (The Paleface) gives the film a decently brisk pace, and the speedy gag-dropping anticipates the anarchic comedy of the Zucker brothers, while a coda that breaks the fourth wall anticipates the work of Mel Brooks. Other than an extended cross-dressing sequence that provides a somewhat flat setup for the finale, there's plenty to enjoy in this timeless comedy. Image Transfer Review: Filmed at the dawn of the widescreen era, it's quite clear this was not meant for widescreen presentation. The full frame carries the compositions perfectly. The Technicolor is reproduced quite well, with vivid, brilliant colors and excellent detail. Black levels are satisfactory, and no artifacting or other issues are noticeable. Audio Transfer Review: The 2.0 mono track is less than admirable, however. The music is quite tinny throughout, and there's a frequent high-frequency hiss that is annoying in quieter scenes. On the whole the sound quality is slightly muddy and unsatisfactory. Extras Review: There are no extras at all, unless you count English subtitles and closed captioning. Bob Hope as great lover? Well, if Woody Allen can do it, why not? A beautiful transfer but no extras at all.